The Cop with the Pink Pistol by Gray Basnight, a Mysterious Review. Review: What should have been a routine call, following up on a report that an apartment had been robbed, turns into something far more complicated — and not just from a crime perspective! 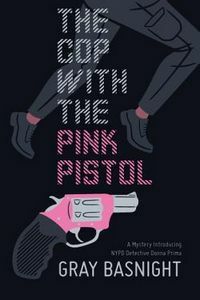 — in The Copy with the Pink Pistol, the first mystery in a new series by Gray Basnight. NYPD homicide detective Donna Prima is a rule-breaker, and makes no apologies for it. But one too many broken rules results in her being assigned "light" duty, taking and following up on calls from victims of minor crimes. One such call has her knocking on the door of Conner Anderson, an actor whose apartment has been robbed. But Conner seems more concerned with a mystery happening across the street: an antique white Rolls Royce parks just outside a bar, a man exits the car and enters the bar, but then returns to the Rolls not from the bar, but from the liquor store adjacent to it. Donna thinks Conner is being overly imaginative, making too much of the circumstances — he tells her he has a keen sense of skull-duggery — but then shots are fired, a crime in progress … or is it? Maybe Donna simply wants to believe the worst, expecting she'll have a chance to bust the bad guys and then have the opportunity to get back doing the work of a real police detective. The Copy with the Pink Pistol is a delightfully entertaining mystery. There's a certain narrative ease present that suggests the author had a grand time coming up with the characters of Donna Prima and Conner Anderson and a situation that would force them to work together … and inevitably develop feelings for each other. It might have been enough to insert these colorful characters into a routine crime story, but the plot in this regard is exciting and unexpectedly complex. To be sure, this is Donna Prima's investigation and she's the main focus here, but Conner Anderson provides contrast, balance and support to her. It may be hard to duplicate the success of this debut in a sequel, still, readers will no doubt look forward to another case for Donna and Conner to solve in the near future. Acknowledgment: Ransom Note Press provided a copy of The Cop with the Pink Pistol for this review.